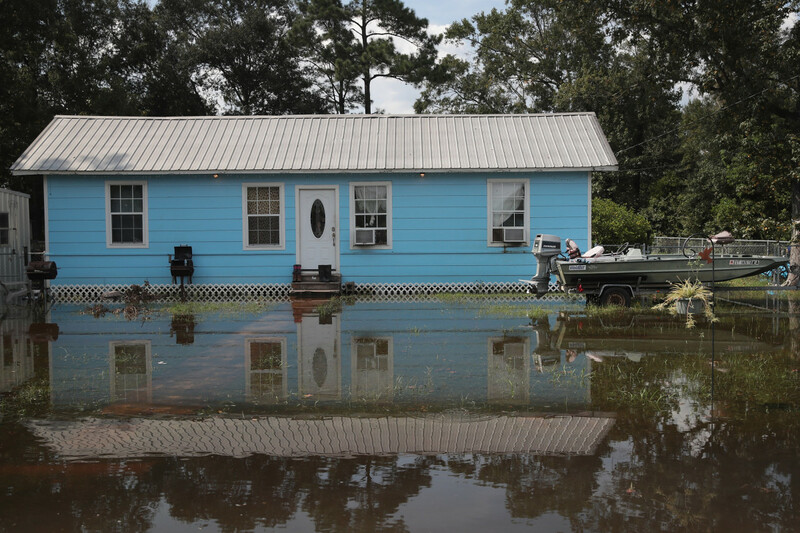 Floodwater surrounds a home after torrential rains pounded Southeast Texas following Hurricane and Tropical Storm Harvey causing widespread flooding on September 3rd, 2017, in Orange, Texas. Harvey, which made landfall north of Corpus Christi August 25th, has dumped nearly 50 inches of rain in and around Houston. 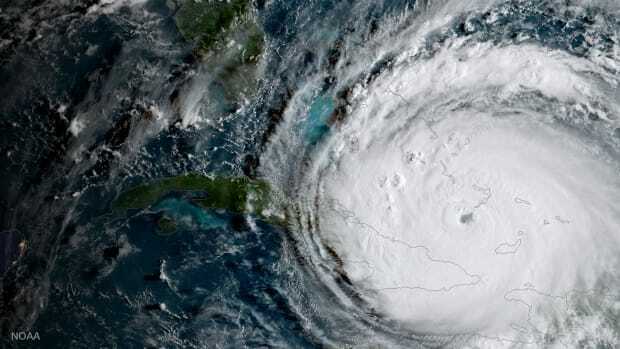 During this year&apos;s record-breaking hurricane season, oil rigs and refineries were just as exposed as any structure on the precarious Gulf Coast, and their owners were limited to the same options as everyone else: evacuate, prepare, and hope the storm was merciful. The devastation Harvey and other storms left behind illuminates just how defenseless oil and gas infrastructure is in the face of hurricanes that are growing in magnitude and frequency and challenging the permanence of the oil and gas industry&apos;s presence in the Gulf. Harvey shut down 22 percent of the nation&apos;s refining capacity, vitally disrupted the oil and gas transportation networks that deliver energy to much of the United States, and caused damage to facilities that leaked more than a million pounds of dangerous air pollutants into communities around Texas. The road back to full operational capacity will take weeks, if not months. It&apos;s no secret that oil and gas infrastructure along the Gulf Coast is increasingly at risk and that climate change could render it useless. The U.S. Government Accountability Office, the Department of Energy, the Department of Natural Resources, countless environmental groups, and oil and gas industry representatives have all openly warned of the coming catastrophe. Extreme flooding, made worse by sea level rise and warming temperatures, threatens the functionality of refineries and processing plants. Hurricanes with 100 mile-per-hour winds hurtle into well platforms, rigs, and ports with increasing regularity and severity. In Louisiana, the disappearance of wetlands and the rapid pace of coastal erosion expose pipelines to corrosive salt water and ocean currents that they were never intended to withstand. Hundreds of billions of dollars of infrastructure investment could be wiped out. 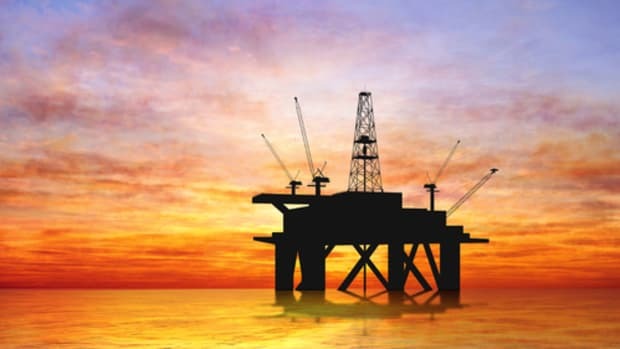 As weather events become more erratic and disruptive, the question becomes whether the Gulf&apos;s oil and gas infrastructure can remain functional in the long term. 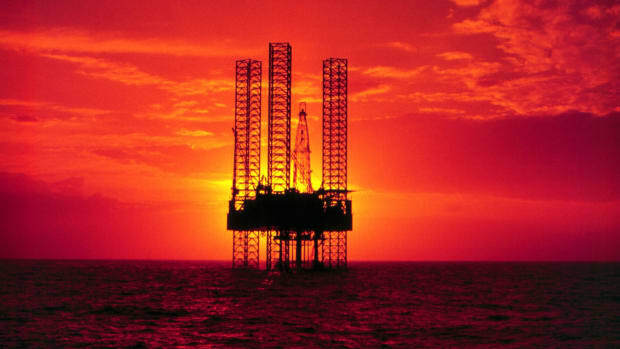 Will oil and gas companies choose to keep repairing and reinforcing their facilities in the Gulf, or will they move on? If they cut and run, what will happen to the communities they leave behind? If the energy sector does shift operations away from the Gulf, the local economies that are anchored in oil and gas will pay the highest price. These communities, already inundated by environmental destruction, will face an employment crisis. The oil and gas industry provides 12.2 percent of the jobs in Texas, 11 percent of the jobs in Louisiana, 5.3 percent of the jobs in Mississippi, and 3.4 percent of the jobs in Alabama, according to a study conducted by PricewaterhouseCoopers for the American Petroleum Institute. Across the entire Gulf Coast, the oil and gas industry employs 2.7 million people. These jobs are concentrated in the coastal counties and municipalities of these states, meaning that the disproportionate over-reliance on oil and gas employment in some communities is even more extreme than the above percentages indicate. The reason for this high volume of energy employment is a colossal apparatus of oil and gas infrastructure in the region. 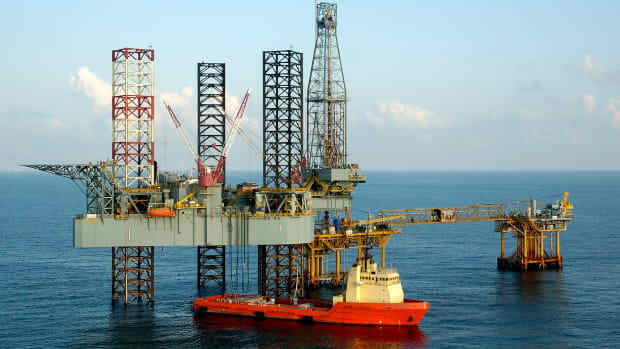 There are 4,000 drilling platforms in the Gulf of Mexico. More than 125,000 miles of pipeline crisscross Louisiana alone, enough to wrap around the Earth five times over. The states that encircle the Gulf of Mexico supply 76 percent of the nation&apos;s liquid fuel and maintain nearly half of the refining capacity of the U.S. The majority of the nation&apos;s oil and gas import/export operations use Gulf ports as well. All told, the energy assets in these four states are valued at $800 billion, and make up approximately 90 percent of industrial assets in the region. Will oil and gas companies so easily abandon decades worth of infrastructure investment? One consideration will be the ongoing cost of repairing and reinforcing energy facilities. 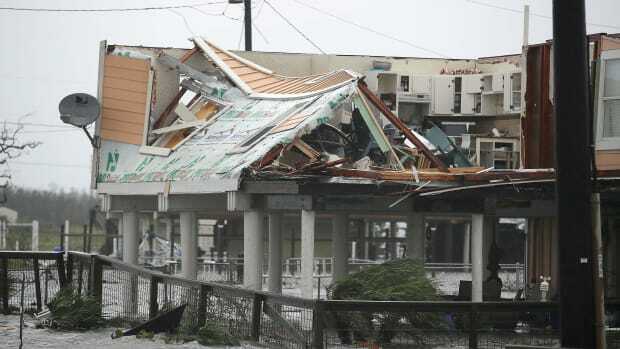 In 2005, Hurricanes Katrina and Rita inflicted $10 billion worth of damage to energy infrastructure alone. And the incidence of these costly reconstructions are likely to increase. According to a report by the Department of Energy, a one degree Celsius increase in global temperatures would make Katrina-magnitude events up to seven times more likely. The decision to stay or go will likely also hinge on the regularity and gravity of operational disruptions. The closure of an oil and gas facility for even a short time has significant implications for a company&apos;s bottom line because they can&apos;t just immediately switch back on. The two biggest refineries in the U.S. were forced to shut down by Harvey. Over two weeks later, neither is back to full operational capacity. There&apos;s no doubt that moving the bulk of America&apos;s oil and gas infrastructure away from the Gulf would be a mammoth task. The oil and gas production and transportation system is complex and interdependent, relying on thousands of entities working in unison around the clock. There is also a question as to whether other coastal states would be as welcoming to the build-up of pipelines that inevitably leak or refineries that spew toxic fumes into the neighborhoods they inhabit. Still, it&apos;s not unheard of for oil and gas companies to desert their infrastructure when profitability has dried up. This country is littered with the vestiges of once-booming oil and gas operations. The decision will ultimately come down to which option the oil and gas companies perceive to be cheaper: rebuilding America&apos;s oil and gas infrastructure on safer ground or constantly rebuilding their old facilities while enduring profit-inhibiting natural disasters that halt production. Either way, the price tag is staggering—and if history is any indication, Gulf Coast communities with the greatest stake in the verdict will not get a vote. One way for communities to insulate themselves from the decisions of oil and gas companies is to stop leaning on them so heavily for employment. Another is to entice industries and jobs that aren&apos;t so threatened by climate change. Renewable energy fulfills both conditions. According to a report by the Center for Climate and Energy Solutions, the Gulf is very well situated to develop a flourishing renewable energy industry. It receives more solar radiation than most of the country and contains a bounty of geothermal energy sources. The Department of Energy claims that the Gulf of Mexico has some of the greatest offshore wind potential in the U.S., and the Gulf currents as well as the region&apos;s many rivers create an ideal landscape for hydropower. On top of all this, the Gulf region already has a trained, experienced workforce in the energy industry. Gulf states could accomplish this transition without federal help by rerouting some of the copious state-level oil and gas subsidies toward renewables. In Louisiana, one oil company alone, Cheniere Energy, has received over $3 billion in state subsidies. State incentives for renewable energy in Gulf States, on the other hand, are severely lacking. A portion of state subsidies could be redirected toward proven programs copied from other states, such as the Solar Ready Colorado initiative, which retrains unemployed miners and oil and gas workers for employment in the burgeoning renewables industry. The next step would be to overhaul the policy and regulatory landscapes of Gulf states to make them more attractive to renewable energy businesses. The current lack of consistent regulations and guiding policies on renewable energy actually discourages the cultivation of renewable businesses and jobs. Overregulation is an oft-cited economy killer, but under-regulation can cause issues too. With perhaps the exception of Texas, the Gulf Coast policy landscape surrounding renewable energy is cloudy and ambiguous. Alabama and Mississippi, for example, are two of only three states that lack net metering policies to guide the integration of solar energy into the power grid. The incentives that do exist are also vulnerable to being capped or eliminated. All of this creates an uncertainty and confusion that repels business. Whether Gulf State governments can break away from oil and gas influence and make these changes is yet to be seen. But the last few weeks have made clear that the economic consequences of climate change compound the destructiveness of environmental ones—and Gulf states need to be ready if the oil and gas industry is swept away.